SPIRIT Comes To Life On Geek EmaNation Podcast! 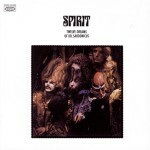 L.A. hippie/jazz/pop pioneers SPIRIT were a big part of the early rock education of host The Rock’N’Roll Nurse, and looked in the late ’60s like they would be as huge as contemporaries JIMI HENDRIX and LED ZEPPELIN. But like so many near-miss stories, they had the supreme bad luck of being in the wrong place at the wrong time. Hear their classic LP 12 Dreams Of Dr. Sardonicus in its entirety, as well as choice selections from their previous 3 records on this love-bead laden episode of The Geek EmaNation Show. Truckin’ Topanga-style, fellow music geeks!